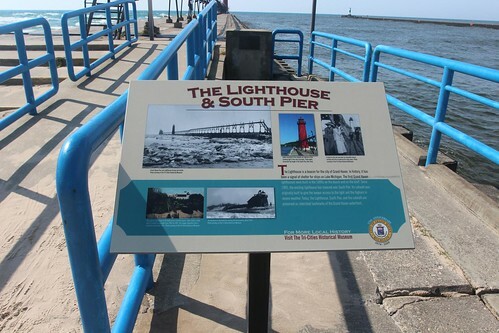 Mali Mish - Day 63: Lighthouse pier and downtown Grand Haven. Day 63: Lighthouse pier and downtown Grand Haven. The weather called for temperatures to be in the mid 70s today. 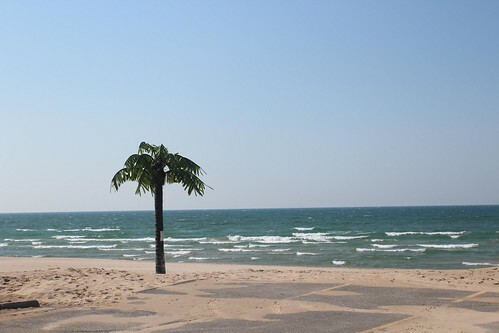 We were really looking forward to a day at the beach and the beach here in Grand Haven is beautiful. Unfortunately, the wind is howling and does not look like it will let up anytime soon. 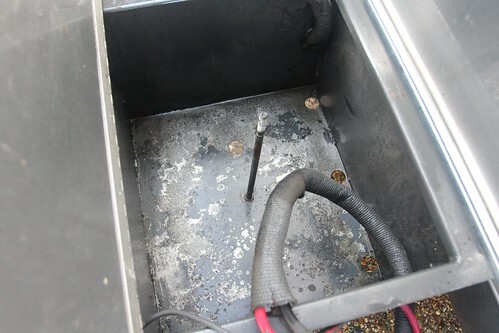 Even though it is windy, the rain has stopped and the drier weather is my window of opportunity to clean out the corrosion in the battery box with a new pair of group 24 batteries. I disassembled the batteries and began scraping and brushing away at the rust and corrosion. 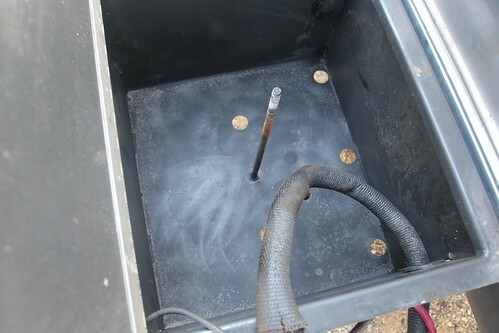 If you have traditional lead-acid batteries in your trailer, it isn’t a bad idea to do at least an annual inspection to make sure you don’t have similar corrosions cooking away at the steel. You don’t want the bottom of it to fall out while you are on the road. It would make for a very unpleasant day. Using a paint scraper, stainless steel brushes and sanding sponge, I managed to clean off as much of the rust and corrosion as I can get to. 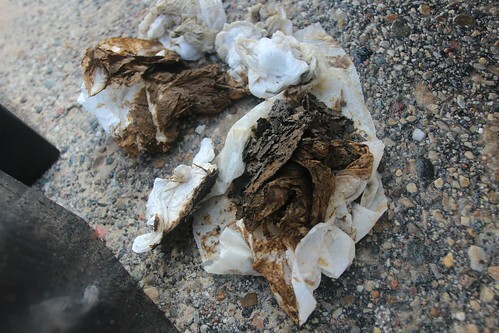 Luckily for me, the rust was just on the surface and had only bubbled away some layers of paint. The integrity of the steel was not compromised. I cleaned it off and let it sit to dry for awhile before giving a blast of automotive primer for some added protection. The girls are loving the proximity of our campsite to the beach. 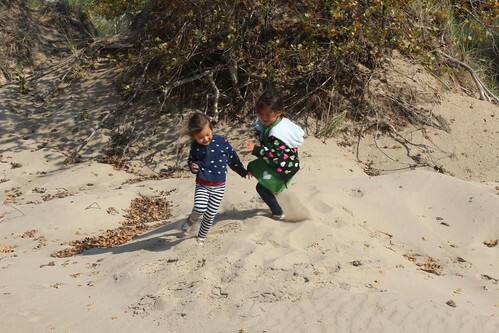 Even though it is windy, they played with their sand toys for hours. 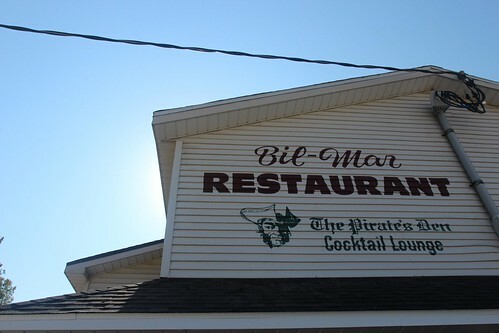 We walked down the beach towards a restaurant called Bil-Mar that a neighbor at the campsite had recommended. It is complete with the only outdoor palm tree within probably a few hundred miles. Although this one is a rare specie sporting plastic bark and leaves. This part of Michigan is known for its sand dunes. The geology from here all the way up towards the upper peninsula are loaded with sand dunes and from more than a few people we have been told to try to make it north up to Traverse City if it is at all possible. 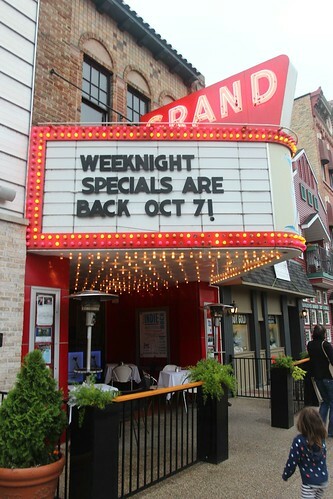 We had not intended on going this far up Michigan but with such high praises, we don’t know if we can pass it up. After a couple of hours, the battery box was dried and the automotive primer made a world of difference from how this thing looked just this morning. With a couple of marine battery boxes and a wiring harness built from parts I found at Walmart, I fashioned a standalone battery bank that I can plug into the 7-point trailer harness. 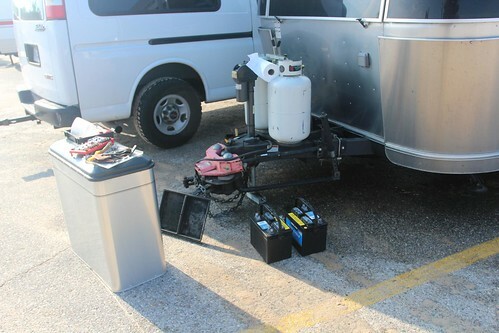 It allows the Airstream to both draw from and charge to these batteries when we boondock again. 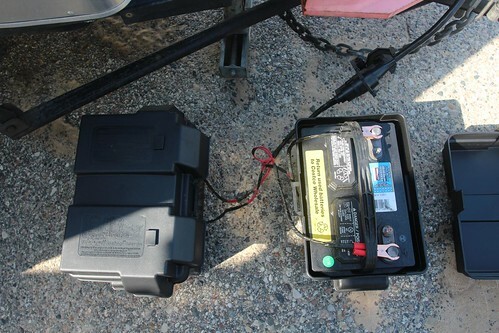 Lead-acid batteries don’t like to be drained below 11 volts and having these around will be added insurance to make sure we don’t cause any damage to our batteries during extended boondocking days. Even though the wind did not let up throughout the day, I decided to take a walk up the pier towards the lighthouse. 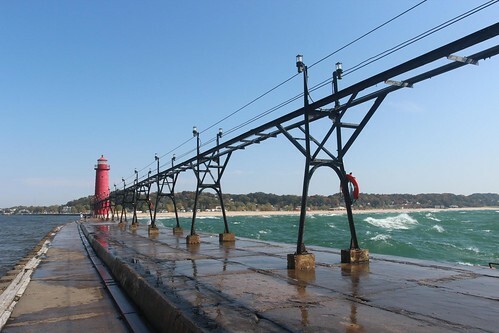 We have seen a handful of lighthouses now along Lake Michigan’s coastline and this being so close to us, it would be a shame to not have any close up photos of it. This pier has definitely claimed its fair share of lives in its existence. Especially during windy days like today, I can imagine how someone can really panic if they got swept into the water and out to open water with the rip tide. 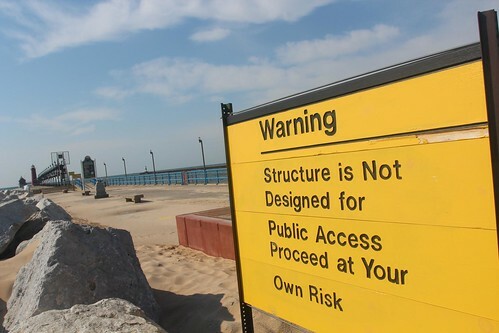 It is hard to see just how rough the water is in still photos but by seeing how wet the pier is, you might begin to imagine the the constant crash of waves against the concrete jetty and water splashing across the structure. 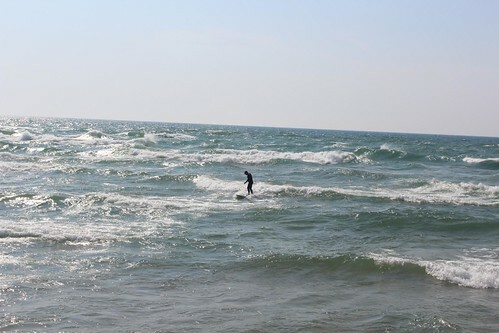 There were actually a couple of midwestern surfers that came out today for the wind swell. Being a west coast surfer, I cannot even imagine surfing in conditions like this. We are looking at 20-30 knot howling winds and extremely choppy water. 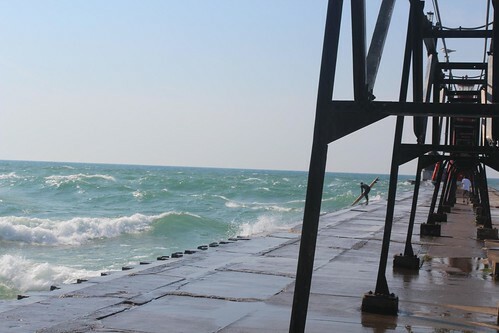 I guess since ground swells are pretty much unheard of in the Great Lakes, today is what would be considered a ‘good day’ for surfing at Lake Michigan. Not only is the water cold, the waves are sporadic and unpredictable. These guys are real troopers to be out there braving the elements for these 2 seconds drop-ins. 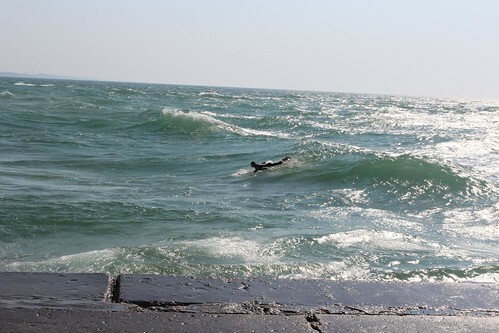 This is pretty much what a good ride looks like in the northern Michigan wind swell. Ava is still all about being at the beach and playing with sand toys. She is impervious to the windy weather and stayed out there for hours. She had been asking to fly a kite that we bought for her during our last trip since we got here. The first time we flew one with her was during our first visit to Albuquerque. 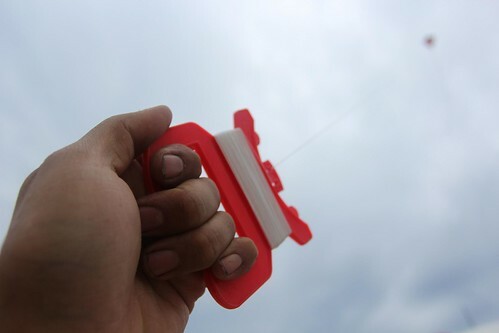 I managed to lose handle of the kite and it flew away from us and into the freeway. I never was able to live down that incident. 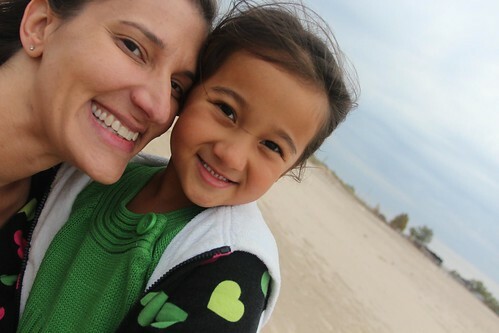 Ava still remembers me losing her Toy Story kite in New Mexico after more than two years. Maybe the fact that Marlene keeps bringing it up to her has something to do with it. 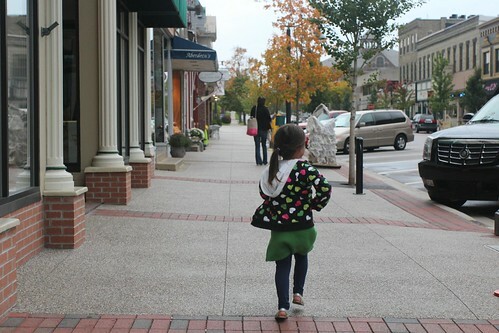 We decided to head into downtown Grand Haven for dinner since it is our last day here. The last days of a trip always remind me of the Dinner Cruise In Maui we did years ago, these moments are so hard to deal with, especially if you’ve made new friends along the way. It is a really clean and beautiful town and during this time of year, we are the only tourists here. 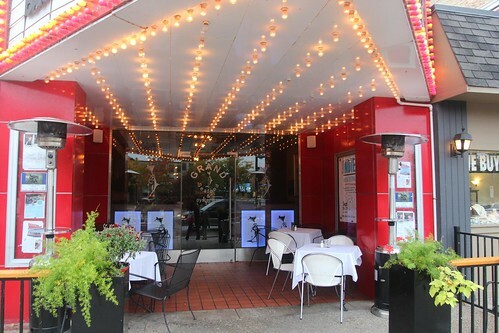 This cool old theater turned restaurant looked like an amazing place to have a meal but it didn’t look like a place that would really accommodate our gypsy children. 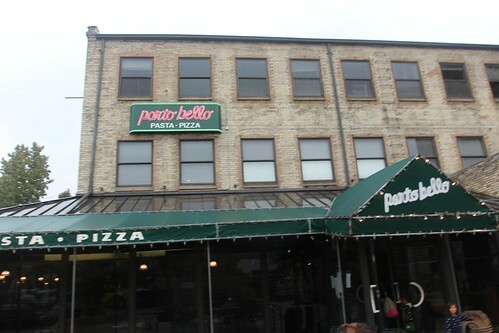 We opted for the pasta and pizza place across the street from it instead. 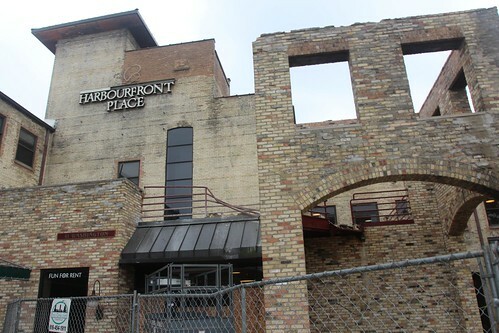 It is right next to the Harbourfront Place that looked like it belonged more in the shambles of Benghazi than the beachfront of Lake Michigan. 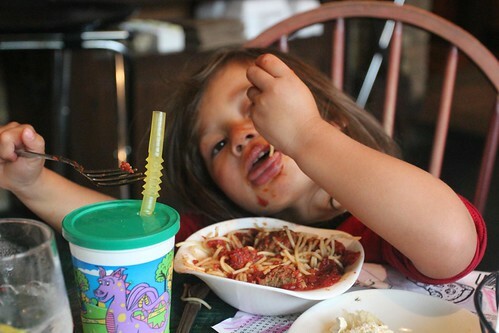 The girls loved the meat ball and spaghetti and Marlene was able to get a diary-free pasta dish. After our meal, Mila asked Marlene to take her to the restroom and on the way back to our table, she clamored about seeing yet another female spirit that appeared to her in the hallway. This was one wasn’t wear pink underwear like the last ones, but was doll-like and swimming in some water. We had not expected northwestern Michigan for another event like this to happen but I suppose we have little control over these kinds of things. After dinner, we tried to do a bit of window shopping but there were very few stores that were still open during the week this late in the season. 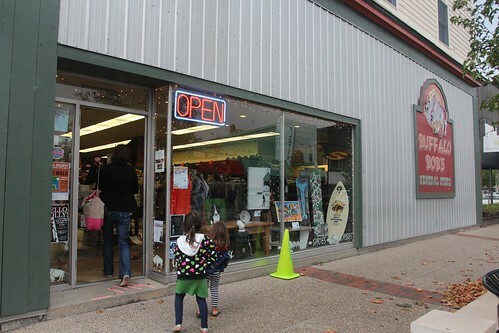 One of the only stores open was this place called Buffalo Bob’s. 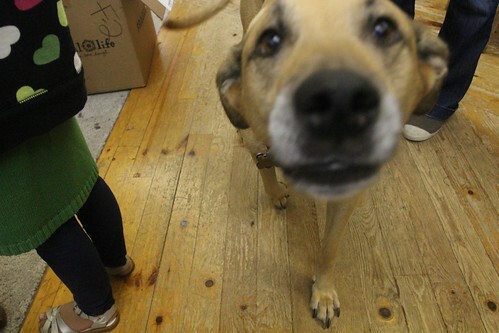 There was a friendly pup that came up to say hi to us right as we walked it. We are expecting some cold weather coming in the next couple of days so Marlene got prepared by getting a wool hat here. 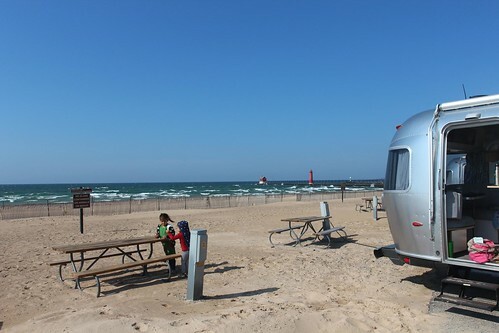 Grand Haven has been a beautiful place to spend a couple of days and if it wasn’t for the wind, it might be one of the most perfect campgrounds for us on this trip thus far. We are headed north tomorrow towards Ludington for the weekend. It came highly recommended and we are also looking forward to meet some facebook friends in person for the first time. 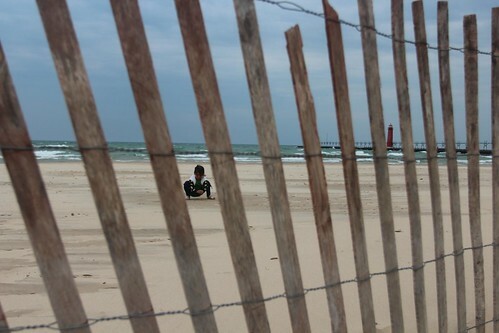 Day 62: Back to the beach at Grand Haven, Michigan. 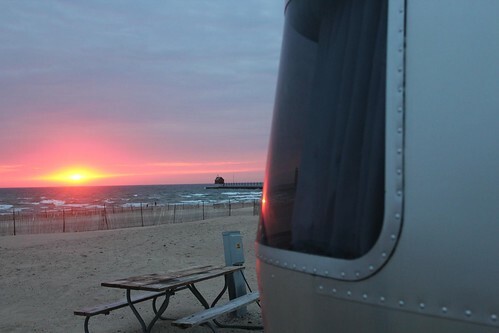 Day 64: Arriving at Ludington State Park.